January 2015 Sagittarius Monthly Horoscope predicts that this month will see you have an abundance of energy. This energy should be used for constructive purposes, such as sports, before it gets wasted in angry outbursts and misadventure. Planetary positions for Sagittarians are favorable for exercising your independence and you can work as per your desire. Still you may have to depend on others to accomplish your goals in life. First three weeks of the month are auspicious for completing the existing projects and the last week can be used for taking up new ventures. The Sagittarius career horoscope for January 2015 foretells that the month is excellent for people in jobs and business in creative fields and sales promotion of products. The financial astrology predictions for Sagittarius zodiac sign is superb during the month provided you work hard. You will get money from many sources. Previous investments will become profitable. You should curtail your unnecessary spending. Love for the Archers will be found in your immediate surroundings and will be serious after the third week of the month. Family and domestic concerns will be in focus during the month, along with improvement in mental stability. Your spouse might feel that you are dominating him or her. Pregnancy might not be on the cards for couples who are planning to have a kid. 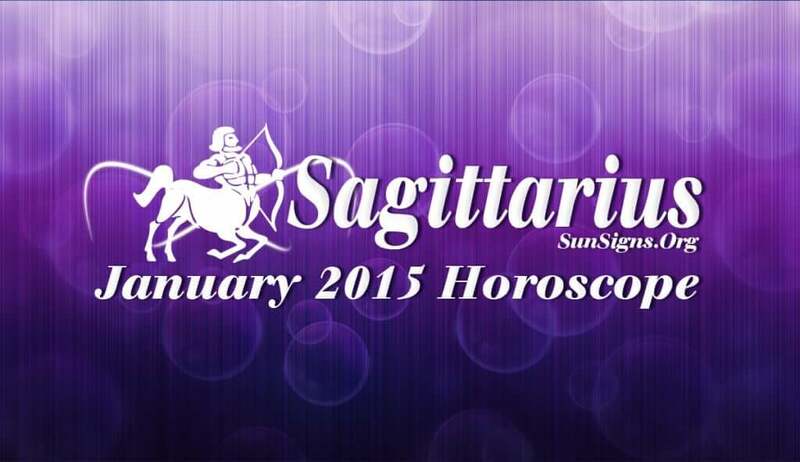 The Sagittarius horoscope for January 2015 forecasts that your health will be up to the mark. You should desist from adventurous activities and concentrate more on maintaining fitness by physical training.